What's a Stamp Tax Anyways? Stamp taxes are nothing new in the world of government revenue collection, having existed in one form or another since 1600s. Traditionally, such taxes are levied on important legal documents such as deeds, securities, marriage certificates, and official notarized goods. However, in this crazy age of computers and i-gizmos, very few governments still bother making you slap a physical stamp on a document. Unfortunately, Japan is not one of these governments. 100,000 for a tiny piece of paper. In Japan, the so-called "revenue stamp" is printed by the Ministry of Finance and it represents money that goes directly into the national treasury. Physically, they are nearly the same size as a common postage stamp and come in 31 denominations ranging from 1 to 100,000 yen. The stamps themselves are often sold in post offices, some select convience stores, and your local legal affairs bureau (homukyoku 法務局). Many government buildings that house places like local immigration offices also sell these stamps on site. According to the law, certain documents must contain a stampage of a certain value in order to be a legally effective document. Without the stamps said documents are essentially worthless scribbles and are inadmissible for tax or legal purposes. Also, willful failure to affix stamps to required documents constitutes tax non-payment and is punishable by up to 3 years imprisonment and/or a fine of 10,000,000 yen in addition to any late fees of up to 3 times the amount of stamp tax owed. The correct answer is "more than you would expect." One of the most common uses for stamps is a ryoshu-sho (領収書) or "official receipt." This is different from a basic cash register receipt insofar as it can be legally used for tax purposes and standard book keeping. Transactions under 30,000 yen are exempt from this duty. 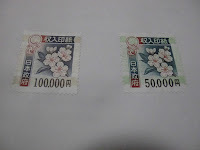 Transactions up to 100,000 yen require 200 yen stamps and the cost of the stamps required rises with the total price to a max of 200,000 yen in total tax. See here for a nice little chart. If you own your own business, it is handy to know how to prepare a ryoshu-sho as customers often demand one for their official records. As a seller, you are legally obliged to affix the appropriate stampage and affix your personal seal and the seal of your company if the customer demands it. A whole bunch of other documents requires stamps as well including monetary contracts, real estate sale contracts, stock certificates, bonds, documents of incorporation, securities, dividend payment receipts and so on. Each one has a different set fee and/or fee structure based on the total value of the transaction. Here is a handy list if you can read a decent amount of legalize Japanese. Services offered by the national government (such as immigration) also require stamps in order to complete. 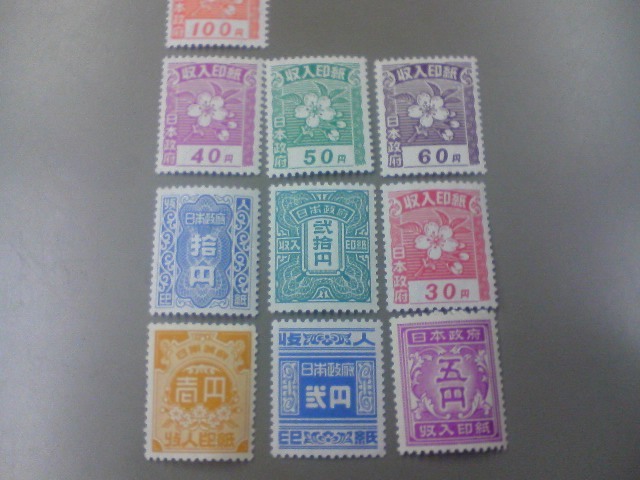 Believe it or not, there is a whole different class of stamps issued by towns and prefectures. These are called shunyu shoshi (収入証紙). What sets shunyu shoshi apart from the typical revenue stamp is that they represent money collected by a town, city, or prefecture. Many services such as renewing and issuing drivers licenses require these stamps. So make sure you don't mix them up with the aforementioned shunyu inshi revenue stamps. 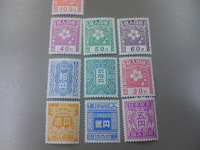 Typically these stamps are issued by a given prefecture. However, some towns uses their own stamp systems to pay for things such as garbage collection and various local services. In my city, shunyu shoshi are actually printed on the garbage bags themselves and must be wrung up separately when buying them. To make things extra confusing, certain government organizations have started issuing their own stamps. For example, when preforming a user shaken, you must affix both a special "car inspection registration revenue stamp" (jidosha kensa toroku shunyu inshi 自動車検査登録収入印紙) and a "vehicle weight tax revenue stamp" (jidosha juryo-zei inshi 自動車重量印紙). The patent office has its own official stamp system as well, just to keep you on your toes. The whole system of having to buy tax stamps has always seemed a bit silly to me, especially when paying for government services as the stamp window is often right around the corner from the service window. Surely someplace as high tech as Japan could think of a better way to go about this. But I am no tax lawyer so I will just have to keep my no-good opinions to myself. However, if you have any knowledge or experiences with stamp taxes in Japan then make sure to let us know in the comment section. If Happy to Inverstment For me Went To Japan ,Tax Of Japan Would be Disclame With the Royalty. Thanks For THe Royalties Of Japan Spend Time For Vist Malaysia Make a Adjustment For the Problem .